Though not patterned after Celebration, Florida, the Parkside at Mayfaire has a similar layout and the palm trees and friendly neighborhood are certainly reminiscent of Celebration. And that is a good thing! . It is located behind Mayfaire Village right off of Military Cutoff. The neighborhood was built between 2004 and 2011 on what was, at one time, the 394 acre Hardy Parker Farm. In fact, one may notice pecan trees still dotting the landscape around the neighborhood. Many of the porches span the front of the houses allowing plenty of space for sitting with visitors or just for family time in the eveings and enjoying the outdoors at the same time. And, make no mistake, your new neighbors are out walking or biking at all hours during the day. It provides with a ready excuse to stop and visit. Or to walk or bike to Mayfaire for a little shopping or coffee or lunch. Well, you get the idea. Wilmington including to Wrightsville Beach and downtown Wilmington. Parkside has a round-about with a beautiful fountain in the center. Across the street from the fountain is a pavilion that allows one to sit and enjoy the pond behind it. Again, a perfect meeting place for neighbors and families to spend time together. The University of North Carolina at Wilmington and Cape Fear Community College are both located mere minutes from Parkside at Mayfaire. As already mentioned, the shopping and dinning available in Mayfaire is within walking distance of this neighborhood. That includes a movie theater, a grocery store and more! residents are able to keep boats there. 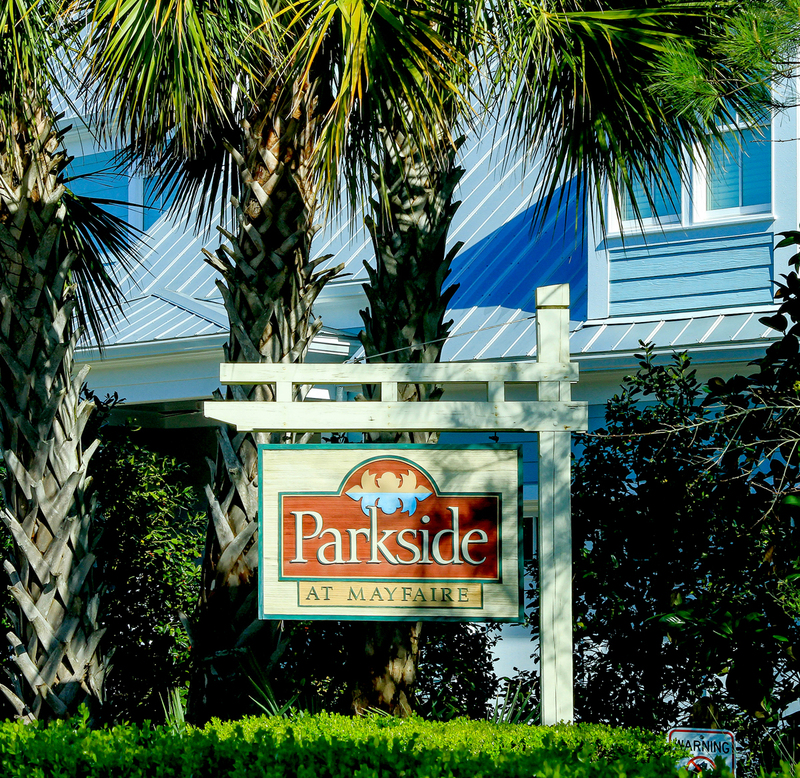 Parkside at Mayfaire is a beautiful neighborhood with an open and welcoming feel to it. The houses are beautiful and the neighbors are friendly. This might just be where your dream house is waiting for you. Don’t wait; someone else may grab it up. Contact us today and we’ll get you in that dream house!